KNOW THYSELF. WHY IS HUMILITY IMPORTANT? HUMILITY, THE BASIS OF ALL VIRTUES, THE DWELLING PLACE OF LOVE. In the post on the” Humility of Jesus,” we saw how Jesus told us to “Learn from me for I am meek and humble of heart” (Lk 11:29). The triumph of God’s love was made possible through His Humility. HUMILITY IS INDISPENSABLE IF WE ARE TO FAITHFULLY LIVE A CHRISTIAN LIFE, —which consists in having a loving and personal relationship with Jesus Christ, leading to our identification with Him through the imitation of His virtues, and thus holiness— BECAUSE IT IS THE BASIS OF ALL VIRTUES, AND THE DWELLING PLACE OF LOVE. Let us not forget that HOLINESS consists in our daily struggle —with the help of God’s grace— to acquire and live the virtues which Christ taught and lived during his life on earth, docilely allowing the Holy Spirit’s transformative action in our soul to “Christify” us. ONLY THE HUMBLE PERSON IS CAPABLE OF TRUE LOVE WHICH DEMANDS TOTAL SELF-GIVING, forgetting oneself, thinking about the others, sacrifice and self-abnegation: all these characteristics we have seen in Our Lord Jesus Christ’s life. Moreoever, ONLY THE HUMBLE PERSON CAN RECEIVE GOD’S GRACE WHICH HAS THE PRIMACY IN HOLINESS. At the same time, all the other virtues are nothing else but different manifestations of love (St. Augustine), which in turn, can only grow and dwell in a humble person. Faith is the humility of the mind which renounces its own judgement and surrenders to the verdict and authority of the Church. Obedience is the humility of the will which subjects itself to the will of another, for God’s sake. Chastity is the humility of the flesh, which subjects itself to the spirit. Exterior mortification is the humility of the senses. Penance is the humility of all the passions, immolated to the Lord. HUMILITY IS THE VIRTUE BY WHICH WE KNOW AND ACKNOWLEDGE OURSELVES AS WE TRULY ARE. IT CONSISTS IN ACCEPTING THE TRUTH ABOUT OURSELVES. Teresa said: “I was wondering once, why Our Lord so dearly loved this virtue of humility; and all of a sudden—without, I believe, my having previously thought of it—the following reason came into my mind: that it is because God is Sovereign Truth and TO BE HUMBLE IS TO WALK IN TRUTH” (The Interior Castle, VI, 10). Know thyself!, says the ancient Greek maxim inscribed at the forecourt of the Temple of Apollo at Delphi. HUMILITY LEADS TO SELF-KNOWLEDGE, ACCORDING TO THE TRUTH, —without any presumption, excuses or justification— OF ONE’S QUALITIES AND LIMITATIONS, OF ONE’S ACTIONS AND OMISSIONS, OF ONE’S ERRORS, FAILURES, AND ACHIEVEMENTS AS WELL. It acknowledges the truth OF ONE’S CONDITION AS A CREATURE AND CHILD OF GOD, and of the fact that ALL THAT WE ARE AND ALL GOOD THAT WE HAVE ARE GIFTS WHICH COME FROM GOD. What have you that you did not receive? If then you received it, why do you boast as if it were not a gift?” (1 Cor 4:7). HUMILITY AS SELF-KNOWLEDGE ACCORDING TO THE TRUTH is important because it will determine the quality of our dealings with others and with God as well. Self-knowledge according to the truth leads us to act naturally without pretensions or hypocrisy before others, but rather showing them who we really are. It also leads us to be more understanding with the people around us, of their errors, limitations, sufferings, miseries, with empathy, mercy and compassion. Moreover, it enables one to think more of the others than oneself. Dear friends, as St. Josemaria said, “It is a great thing to know oneself to be nothing before God, because that is how things are. (Furrow, n.260)” LET US THEN ASK OUR LORD FOR THE GRACE TO STRUGGLE DAILY TO BE MORE HUMBLE SO THAT HIS LOVE CAN DWELL IN OUR HEART. MOTHER MARY, ANCILLA DOMINI (HANDMAID OF THE LORD) AND DWELLING PLACE OF GOD WHO IS LOVE, pray for us, your children, who love you so much SO THAT WE MAY LEARN FROM YOU AND OUR LORD AND GROW DAILY IN HUMILITY! -Fr. Rolly Arjonillo, priest of Opus Dei. Please like our page CATHOLICS STRIVING FOR HOLINESS and invite your friends as well to do so in order to help more people. Thanks and God bless! 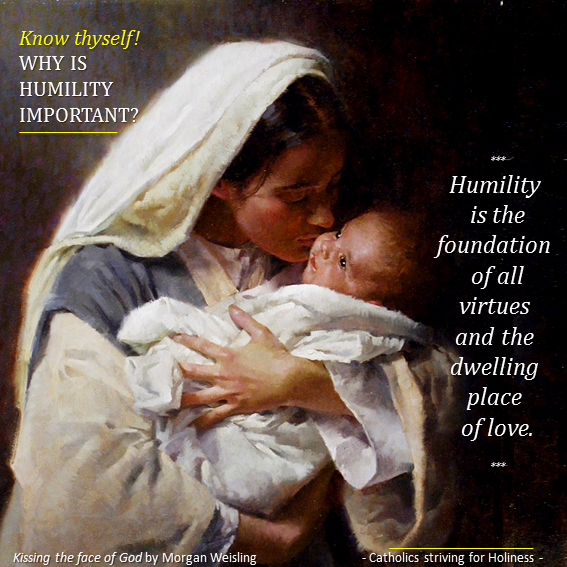 PHOTO SOURCE: Painting by Morgan Weisling, “Kissing the face of God” in www.thecatholicspirit.com. Picture not mine, used only for didactic purposes without any intention to infringe any copyright law.